I've spent the last three months going back and forth to the Kennedy Center. We're having The Boy reevaluated. And the process, has sparked lots of old feelings. In May it will be 4 years since The Boy's diagnosis. And I think back to the April before the diagnosis - when I was waiting for the results of all the evaluations. When I was hoping for the best while preparing for the worst. When almost everyone was telling I was worrying for nothing. When The Husband was certain there was nothing 'wrong.' I didn't even know April was Autism Awareness Month or that April 2nd, was World Autism Awareness Day. ﻿﻿Had I known what autism was, I wouldn't have waited so long. I would have gone with my gut feeling and had The Boy evaluated months before he turned two years old. But that's neither here nor there. I can't turn back the clock. I don't care about what caused autism. And have no desire to cure The Boy. What I do care about and what I can do - is spread awareness. I believe Autism Awareness and Acceptance needs to start at an early age. Children who are taught to understand and accept autism, will grow into adults who understand and accept. Some groups consider autism to be an epidemic - I don't believe that's true. The real epidemic is ignorance. And ignorance can be easily cured with knowledge. No special studies or research needed. I'd like to share something that was sent to me by my FB friend Jessica - a fellow warrior mom. Jessica has three beautiful children. Emilia, Charlie & Stella. Charlie has autism. And Emilia was asked to give a speech at her school - in front of 400 children. When Jessica shared Emilia's speech with me on Saturday - I was so incredibly moved and I knew I had to share it here. Autism Awareness is Monday, April 2nd. Autism is a mental disorder that many kids, including my brother have. They aren't gross, or weird, or contagious. They are just like us, but have a hard time learning or communicating. Many people say that autism is a puzzle. They say this because autism is hard to figure out. The color blue represents autism, like pink represents breast cancer. Did you know that the Empire State Building lights up blue in honor of Autism Awareness? Lots of people are working to find a cure for autism. 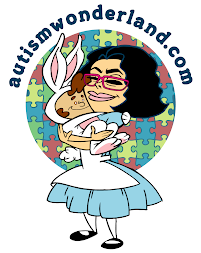 As I said before, Monday is Autism Awareness day, and I would like everyone in the school to wear blue on Monday to represent autism awareness. Emilia's speech will impact the way her classmates think about autism. Not even 10 years old, and she's making a difference. I wish there were more Emilia's in the world. I've learned so much being The Boy's mother. Our children can teach us so much, all we need to do is listen. Today is World Autism Awareness Day. But it's also Autism Awareness MONTH. So if you didn't wear your blue today - you have the rest of the month to show your support.